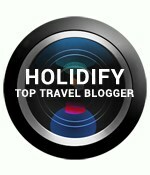 We all read stories of animal adoption or that of wildlife safari in our daily lives. But seldom have we got to hear stories about people or tribes who actually feel responsible towards protecting the wildlife and environment and act as their guardians. This is the story of pure love and compassion of a Tribe in Rajasthan which is known to be the strict protectors of Wildlife and surroundings. It’s the story of unconditional love where the animals are actually breastfed and tribeswomen bring them up at par with their own children. The sight has shocked many outsiders, but here amongst the ‘Bishnoi’ tribe; animals are just as much a part of the family as their own offspring. 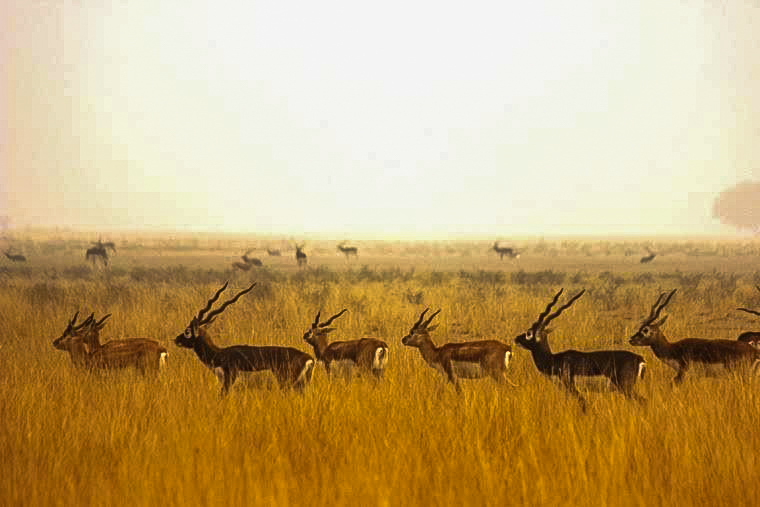 It is because of their protective nature that in Bishnoi dominated areas, deer and antelope (such as blue bulls, black bucks, chinkaras and chowsinghas) are seen grazing peacefully in the fields. The Bishnois reside in the parts of Gujarat, Madhya Pradesh, Uttar Pradesh, and Rajasthan, and treat the animals like their own family. Causing damage to the environment is a sin to them. They are vegetarians. Despite being Hindus, they perform burial rituals, as they avoid burning trees and instead choose to decompose bodies to enhance the soil. 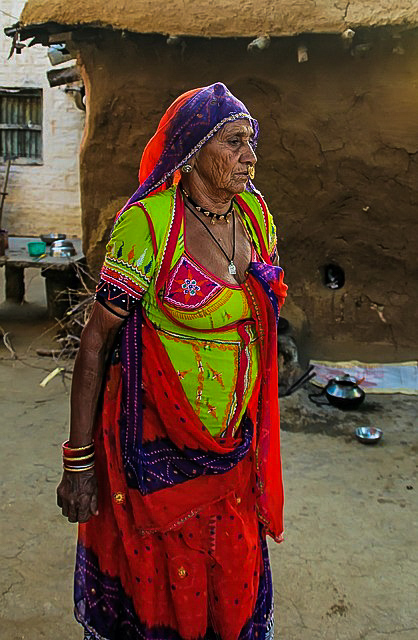 The Bishnois consider trees as sacred, but their empathy extends to every living being on earth. 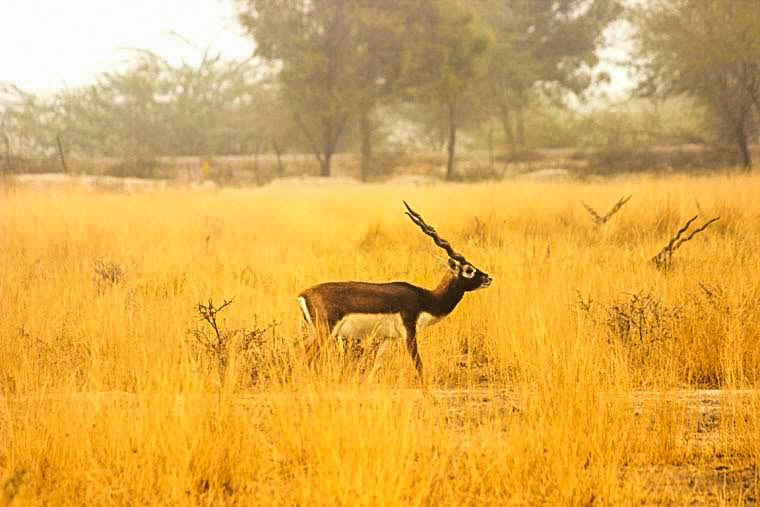 Animals like blackbucks and chinkaras, and birds like vultures, partridges, peacocks and even the endangered Great Indian Bustard, find the Bishnoi village a safe haven. Not only do the Bishnois protect them from poachers, they also actively participate in helping them lead a life of plenty. By allowing them to graze freely in their farmlands; by keeping stone vessels near their home that are always filled with water; and even hanging water-filled pots from the branches of trees for the birds to drink from. Some Bishnoi temples also double up as rescue shelters, like the one in Jajiwal. 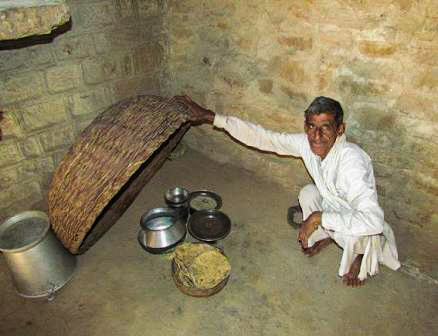 Here the priest takes care of the injured nilgais, blackbucks and chinkaras, and even feeds them twice a day. Some of them go back into the wild, while the others prefer to stay in the temple compound, roaming free. 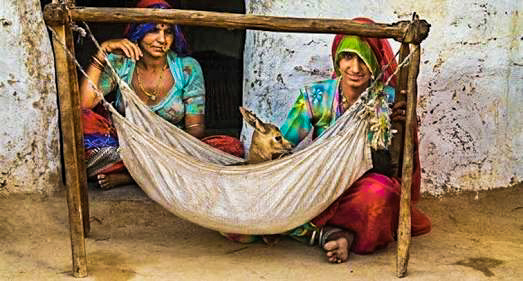 Even the Bishnoi women take maternal care of the rescued calves, sometimes breast feeding them if they are newly born. When they are able to walk and fend for themselves, they are released back into the wild. The most famous story is the one of Amrita Devi. She was a young girl that sacrificed her life in order to save the Khejri trees (Rajasthan state tree). When she saw that the soldiers sent from the Jodhpur Court wanted to cut the trees down for their wood, she went and hugged a tree. However, the soldiers didn’t get intimidated by the girl’s gesture. As such they killed her as they were cutting the tree she was hugging. Her gesture encouraged others in her village. Therefore, they all did the same thing and ran to hug a tree. Until there was an order to stop the cutting of trees, 363 Bishnois lost their lives. And it is from this story the Bishnois are called tree-huggers. It’s a rule Bishnoi community is obeying which has been suggested by their Guru, Sri Jambeshwar Bhagwan, since the 15th century, who is believed to be an incarnation of Lord Vishnu. However, it is interesting to notice that the Bishnois have neither idols nor statues of gods in their temples. According to the legends, Jambeshwar never uttered a word till the age of seven. The concerned parents called a priest who suggested that a puja should be performed after lighting 64 lamps. The idea was to enlighten the boy. Despite all the efforts, not one of the oil-filled lamps could be lit. In the midst of all the commotion, little Jambeshwar picked up an earthen pot, tied it to a slender sewing thread and lowered it into the well. And pulled out a pot full of water. Then he removed the oil from all the lamps and poured water in its place. To everyone surprise one by one all the 64 lamps lit up on their own. Maybe even as a kid, he was enlightened enough to know that water is the very source of all life! From the age of 8 to 34, Jambeshwar led the life of a cow-herd. Though he was born into the warrior clan of Rajputs, he chose to be different. Instead of developing hunting skills, he worked on communication skills with all living things. For hours on end he used to converse with plants and animals. At the age of 34, Lord Jambeshwar sat on the shifting sand dunes of a place called Samrathal, and meditated on the transient nature of life itself. When he turned inwards he realized that he has to chart a course of his own. And sitting in that barren brown landscape he saw visions of a green paradise. He then summoned his innumerable followers and told them that they need to follow a new belief system on which their entire life will be based. As their lives would be governed by these 29 principles, they would be called Bishnois; derived from the words “bees” that’s twenty, and “noi” that’s nine. Though there are 29 tenets in this belief system, the most important of them all is ‘praan daya’ or compassion for all living things. For close to 525 years, every Bishnoi, young and old, has lived and even died for this spirit of compassion. A traditional annual celebration in honor of Lord Jambeshwar is still observed on the first night of the new moon in the month of Chetry. Thousands of people make the pilgrimage to the remote desert village to drink the salty water from the sacred source, believing it will cleanse them of all their sins. · Rules about spiritual life – they have to practice havan, of which they say it helps clean and make the environment pure fast. They changed too but for better! A major change which happened in the psyche of the Bishnois is their shift from passive conservation to active conservation. Once upon a time they were content laying down their lives. Today they actively pursue armed poachers with a mere lathi and tonnes of courage, capture them and hand them over to the forest authorities. In the last 20 years, it is believed that around 14 Bishnois have died defending these animals. The reflection of their new found aggression is an organisation called the Tiger Force. It’s a 1000-strong brigade of young, fearless warriors of wildlife protection. Spread across hundreds of villages across Jodhpur, they are now active even in other parts of Rajasthan. Being nature lovers to the core, they bemoan the fact that, under the Indian Wildlife Act, animals are accorded various levels of importance. But to a Bishnoi, killing a monitor lizard is as hideous a crime as killing a tiger. To them, every life has the same value. Surely it’s a perfect harmony between man and animal…May the tribe only grow & stay the same! Great to know that there are people who don’t just preach but live through it. After all, every living being has equal rights on this planet!